Whadjuk Nyungar have lived for over 40,000 years in the vicinity of Derbal Nara or Cockburn Sound. In recent centuries, Wadjella began to arrive from different countries and eventually sat down and yarned with Whadjuk Nyungar. Traditional owner Dorothy Winmar recalls a story from early contact. DW:	When the Wedjelas first came here, the Nyungars lived on the top of Kings Park and they saw the ship coming in. Grandmother said they thought it was the spirit of their people coming back and they were scared of what was coming back, that they were ghosts. But then they learnt that they were another sort of people, white people and then they got used to seeing them and talking to them. Another time, another little ship came in with a barge on it and the barge came out with a horse on it. The Aborigines had never seen a horse before. My grandmother [*maybe great grandmother?] was a little girl and she ran and climbed up the tree. She was scared because she thought the monster was coming to eat her up. LC:	What did the Nyungar call those horses? DW:	They called those horses gnoorts. LC:	And they thought it was a big jennark? DW:	Yes, they thought it was a jennark because they used to tell stories about the jimbars in those days. The jimbar had a big mouth and used to bite the black people and eat them up. LC: And the jimbar is a spirit? DW: The jimbar was like a dinosaur, as big as a dinosaur. The timeline below represents the key events in the immediate area of Derbal Nara or Cockburn Sound. It also includes events in the broader context that impacted on the area and its residents. The timeline complements another timeline produced by City of Cockburn, which emphasises the local development of the Cockburn1 area. 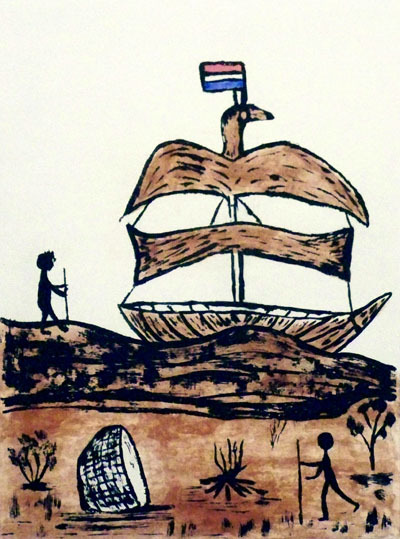 Dreamtime stories describe the times when the islands were linked to the mainland. See Derbal Nara Estuary of the Salmon. A Changing Coastline. 5-10,000 years ago The Nyungar cultural memories and oral stories account for the end of the last ice-age and the creation of Derbal Nara or Cockburn Sound and associated islands. See When the Sea Levels Rose. 1696 - 1697 On Christmas Day, 1696, the Dutch expedition led by Willem De Vlamingh on the Geelvinck with two other vessels sighted land and a few days later anchored off a large island. As explained by Battye8 on exploring it (the island) they were struck with the large number if rats' (wallabies) nests to be seen, and gave it the name of Rottenest Island. Vlamingh landed on shore at Cottesloe, 5 January 1697. 9 January, 1697, anchored off mouth of the river, explored the river, which they named 'Swaane' after the discovery of Black Swans. 1827 Captain James Stirling reached Rottnest on the Success. Moored for night. Next day the Success was brought to within a kilometre of the entrance to Swan River before relocating and dropping anchor further to the west-south-west. Explored Swan River on small boat (gig). Also explored Garden Island by gig. During these explorations, had no difficulty crossing the bar at the river's mouth. 1831 Roundhouse built in Fremantle to hold prisoners. Utilised under this purpose until 1890s. The next day in what was considered a revenge attack, Yagan, Midgegooroo and another Whadjuk leader, Munday, were implicated in the deaths of two settlers. They were declared outlaws, with a reward of £30 posted for the capture of Yagan. On 22 May Midgegooroo was apprehended, and executed without trial. Munday successfully appealed his charge. Yagan remained elusive until 11 July when he and a group of Aboriginals approached Bull's farm in Upper Swan looking for some flour. They were met by brothers William (18-years-old) and James (13) Keates, who had been friends with Yagan, and accompanied them for the rest of the morning. The brothers had reportedly wanted the reward for a passage back to England. At the Swan River, Yagan declined to go any further with the group and William took this opportunity to shoot Yagan through the head. In the fight that ensued William Keates was killed and another Aboriginal, Heegan, was mortally wounded. 1838 Commenced use of Rottnest Island as a prison for Aboriginal offenders. 1927 - 1954 Prohibited Area: City of Perth was a prohibited area for Aboriginal people. 1954 The Native Welfare Act (W.A.) passed. 1993 Native Title Act was the Commonwealth Government's response to the High Court decision relating to the Mabo Case. The full claim boundary (which includes Part A) begins on the west coast of Western Australia, at a point north of Jurien Bay, to a point approximately north of Moora and a point on the southern coast between Bremer Bay and Esperance (Wilcox J, Preceding Statement, 19 September 2006). Due to both the complexity and resource limitations presented by the question, the Court did not resolve whether the right to exclusive possession existed: [838 - 840]. Ongoing relations are represented through ABS data, native title claims, Welcome to Country protocols, NAIDOC week, and a wide variety of festivals (such as the Cockburn Spring Fair and the Fremantle Festival). Further research will add to public understanding of Nyungar- Boodjar-Wadjella relations. 1. City of Cockburn, History of Cockburn Thematic Framework, 26. 2. Flood, Archaeology of the Dreamtime, 93. 3. Western Australian Planning Commission, Indigenous Heritage, 31. 7. Appleyard & Manford, The Beginning, 62. 8. Battye, Western Australia: A History, 40. 9. Appleyard & Manford, The Beginning, 87. 10. Appleyard & Manford, The Beginning, 87. 11. Appleyard & Manford, The Beginning, 46. 12. Green, Broken Spears, 80. 13. MacFaull, “A Native Shot” The Perth Gazette, 4 May 1833, 71. 16. Green, Broken Spears, 167. 17. Green, Broken Spears, 172. 18. SWALSC, An Introduction to Noongar History and Culture, 2. 19. SWALSC, An Introduction to Noongar History and Culture, 3. 21. SWALSC, An Introduction to Noongar History and Culture, 3. 23. Australian Government, “Aborigines Act 1905”. 24. Green, Broken Spears, 172. 25. SWALSC, An Introduction to Noongar History and Culture, 6. 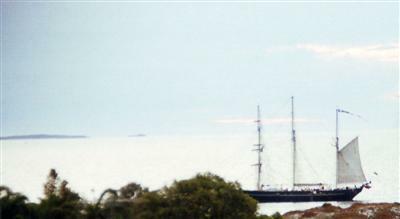 Photo Mary Blight - The Leeuwin at Coogee.